On May 29th, 2014, the Greek Section had its 9th Technical Meeting for the 2013-2014 season. 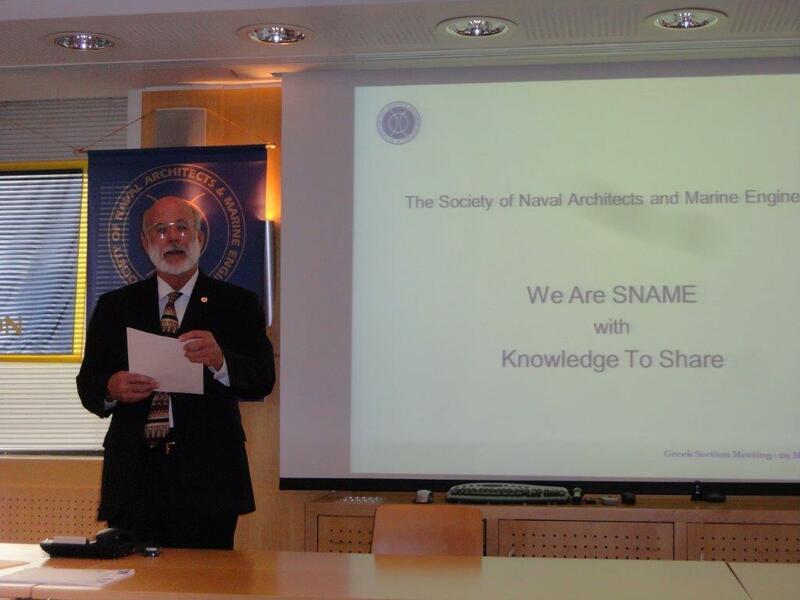 In the presence of SNAME’s President Elect Joe Comer and of an audience of 33 members and 2 non-members, including a number of students of the National Technical University of Athens, Professor Dimitris Pantelis, Professor at the School of Naval Architecture and Marine Engineering of the National Technical University of Athens, and Director of the School’s Shipbuilding Technology Laboratory, presented the above topic. Before the technical presentation Mr. Joe Comer spoke briefly about SNAME and its mission. The speaker first presented a brief overview of friction welding methods, including Rotational Friction Welding, Friction Stir Welding, Linear Friction Welding, Orbital Friction Welding and Radial Friction Welding. Subsequently, Prof. Pantelis focused on the details of the relative new technique of Friction Stir Welding (FSW). First, he presented the main principle, which utilizes a welding tool, consisting of a shoulder and a specially designed pin; the tool is plunged into the plates to be welded, while rotating and advancing at a welding speed along the joint line until the plates have been butted together. Then, Prof. Pantelis referred to the parameters affecting the welding quality, as well as to different types of FSW machines and welding tools. Subsequently, he analyzed details of the process, in particular material flow and the characteristic micro-structural zones formed. Then, he referred to possible defects, and summarized the main advantages and limitations of the method. Next, he discussed issues related to applying the method to the welding of aluminium alloys, steel, as well as titanium and copper alloys. He concluded by referring to specific topics of current research and examples of applications, including in the shipbuilding industry. The seminar was followed by questions to the speaker and an interesting discussion on the topics addressed by the presentation. Main issues discussed were: (a) the financials of the method, (b) its potential for the shipbuilding industry, (c) details of relevant research at the Shipbuilding Technology Laboratory of NTUA. The meeting was concluded with the traditional reception of the local section in an adjacent hall of the MARAN Tankers Management building. 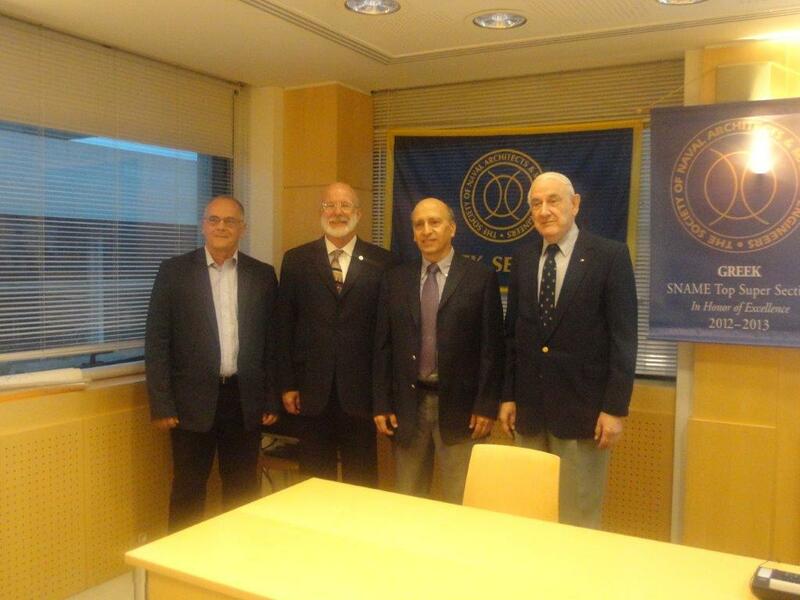 ( from left to right ): A. Papanikolaou, Chairman; J. Comer, President Elect; D. Pantelis, Author; P. Lalangas, Secretary / Treasurer.